This map demonstrates cartographic generalization techniques applied to web map rendering. 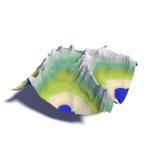 Generalization of the coastlines is done using the coastline_gen tool. A more detailed explanation on the importance of generalization in map rendering can be found in my essay on coastline generalization. Also available is a description of the process of generalizing rivers and lakes. If you want to render your own maps using a generalized coastline you can download a set of coastline vectors for zoom levels 1 to 8 based on OpenStreetMap data. Very usefull tool for earth science! muito interessante, principalmente para aplicar em meus estudos bíblicos e mostrar com clareza as informações geográficas para meus alunos. Obrigada por sua dedicação em reunir tantas informações.